Join Girl Kuripot’s Giveaway to win Travel GCs from Anywhere Philippines! 1. Subscribe to Girl Kuripot by email. Check your email and verify. Join @Girl Kuripot’s Giveaway now if you ♥ to win Travel GCs from @Anywhere Philippines! Click http://bit.ly/eG5qAH now! 3. Tag 5 friends in the picture. 5. You earn 1 raffle entry for doing steps #1 to #4. 5. One winner will win a P2000 Travel GC from Anywhere Philippines (validity: 6 months). 6. Deadline for submission of entries is March 14, 2011 11:59 p.m.
You can repeat posting with a different set of friends (no duplicates) 3 more times (Valentine’s Treat is the 4th) until the end of the promo period (1 raffle entry per post). Make sure you complete steps #2 to #4. Leave a comment below with the link. Blogger? 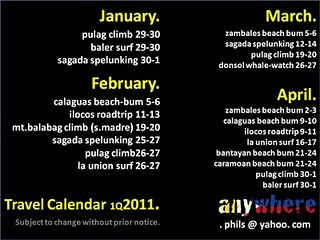 Make a blog post with links to this post and Anywhere Philippines’ website and Facebook Fan Page. (3 raffle entries). Make sure to leave the link below like step #4. There's another blogging contest waiting for you in this post Travel For Free! Go Anywhere Philippines!